Tales2go.com■Retail Price: $600 to $1,900 per year per school building, depending on student population. Licenses are also available for individuals, classrooms, districts, and consortiums. Quality and Effectiveness: Tales2go, a streaming audiobook service, gives users access to over 5,400 high-quality titles from well-known publishers, including Scholastic, Recorded Books, Blackstone Audio, and Weston Woods Studios, and from leading storytellers, such as Bill Harley, Odds Bodkin, Regi Carpenter, and Willy Claflin. Titles include classics as well as contemporary titles, fiction and nonfiction, for students in grades Pre-K–12. Some Spanish language titles are available for all ages and Spanish language music is also available for younger students. Teachers can search Tales2go’s lesson plans, which are aligned with Common Core State Standards, by listening skills such as phonics and fluency. Because professional voice actors read the books, students can build listening and vocabulary skills by hearing fluent readers. They can also listen while reading along with printed texts. Ease of Use: Setting up a Tales2go account is simple, and once it’s activated, Tales2go creates all student and teacher accounts and connects users to a team of dedicated specialists who can help with any problems. Browsing and searching for titles is also easy—by keyword, age, grade level, genre, Lexile level, author, characters and series, narrator, publisher, new and different, and so on. Each category allows users to further narrow their search for the perfect book. Tales2go also offers Webinars and video tutorials to get started using their technology in the classroom. 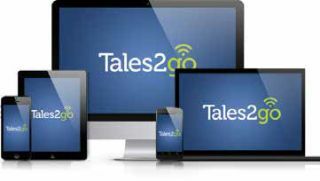 Creative Use of Technology: Available for use in a Web browser, and as an app for Apple iOS and most Android devices, Tales2go offers unlimited, simultaneous, instant access to titles—even without a continuous Internet connection. Students can bookmark their stories at school and continue to listen to them at home. Each student receives a one-year license to “take home” titles on a personal device. Tales2go will generate metrics reports at a school’s request, providing information about the amount of time spent listening and on what type of device (school or BYOD) the listening occurs. The more details schools provide when they set up their accounts, the more detailed the metrics reports will be. Suitability for Use in a School Environment: Students build fluency and vocabulary not only by reading, but also by listening. Common Core State Standards emphasize listening as an important skill, alongside reading and speaking. Tales2go points to research that indicates that the more students hear sophisticated vocabulary, the more proficient at reading and the better prepared for academics they will be. Removing the obstacle of decoding can also help students become better readers as they listen to fluent readers and build comprehension skills by engaging with more complicated story lines. Students can listen to literature above their current reading level to improve fluency and vocabulary. Teachers will be able to incorporate the books into the curriculum easily, and quite a few of the titles are already part of many curricula. Tales2go’s lesson plans also help teachers incorporate listening stations for their students. Tales2go is a great resource for teachers who want to help strengthen their students’ listening, fluency, and vocabulary skills, in addition to broadening their exposure to good literature. With a wide selection of books from established publishers, teachers and students are sure to find titles that meet their needs. ● Quality—Great titles and professional narrators mean that the stories are enjoyable and are also effective tools for building fluency. ● Selection—With over 5,400 titles to choose from in a variety of genres (both fiction and nonfiction), there’s something for everyone. ● Ease of use—Tales2go’s search and browse features make it easy to find stories for students.